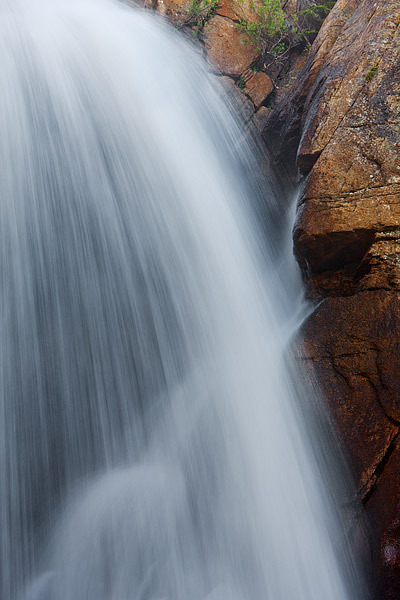 Rushing water spills over the rocks and boulders of Ouzel Falls. The North Saint Vrain Creek is running at a good clip which helped to make accentuate and make Ouzel Falls and even more impressive sight. Located in the Wild Basin section of Rocky Mountain National Park, Ouzel Falls is one of many hearty water features found in the area. Wild Basin's streams and waterfalls, combined with it's thick timber give it a feeling that is unique to other areas of Rocky Mountain National Park. Ouzel Falls is named after the bird also known as the American Dipper. After hiking to Ouzel Falls, keep and eye out for the birds swimming and splashing through the undercurrent in search of food. Photo © copyright by Thomas Mangan.